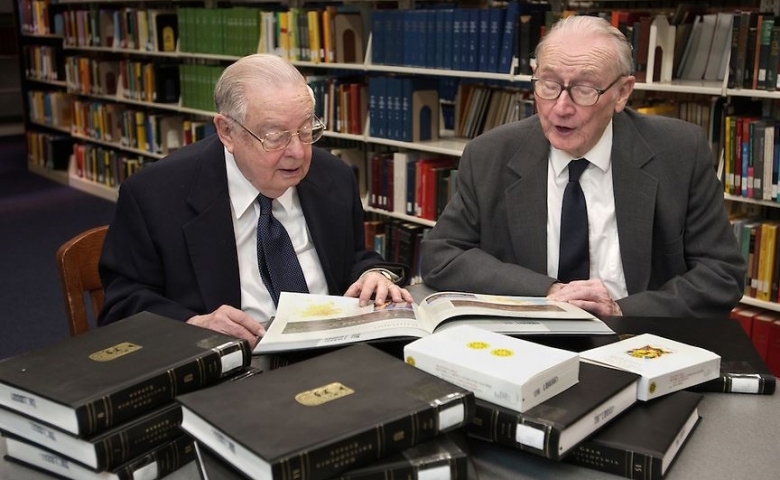 Chuck Noyes (right) and his close friend and colleague, John Pilkington, a senior professor of American literature, often worked together to strengthen the J.D. Williams Library. Drs. Harvey and Di Ann Lewis of St. Petersburg, Florida, are supporting the J.D. Williams Library on the Oxford campus while honoring the late Charles E. Noyes, professor emeritus of English. “Dr. Noyes and I had a very professional and personal relationship while I was executive vice chancellor and he was my associate vice chancellor,” said Dr. Harvey Lewis. “His in-depth knowledge of the university and long years of managing the Friends of the Library membership and fundraising with Dr. John Pilkington (distinguished professor emeritus of English) were noteworthy. The Lewises married in 1961 when Dr. Harvey Lewis also graduated from Mississippi State University with a degree in banking and finance. He continued his education at the University of Arkansas where he earned his bachelor’s and doctoral degree. He worked in leadership at the University of Central Florida, University of Mississippi and Mississippi State University. Dr. Di Ann Lewis earned her bachelor’s, master’s and doctoral degrees from Mississippi State University. She was director of special education, gifted and reading with Lafayette County Schools. Later, she joined Mississippi University for Women as an assistant professor of education. Additionally, she served eight years as executive director of Gear Up Mississippi with the Mississippi Institutions of Higher Learning. Noyes, a Natchez, Mississippi native, spent most of his youth in Memphis, Tennessee, where he attended Rozelle Grammar School and Central High School. He completed both bachelor’s and master’s degrees at the University of Missouri and earned a doctorate from the University of Texas. He was a member of the prestigious Phi Beta Kappa and Phi Kappa Phi honor societies. Noyes served in the U.S. Army Air Corps from 1942 to 1946, attaining the rank of major. His service included the post of assistant chief of staff of the Third Army Airways Communications Wing, headquartered at Anchorage, Alaska. Before joining the Ole Miss faculty, he taught at the University of Missouri and the University of Tennessee. His career in the classroom focused on Restoration and 18th century English literature. Noyes also served UM in the roles of provost, acting vice chancellor, associate vice chancellor and director of the summer session. Noyes, who passed away in 2008 at age 91, is widely credited with providing invaluable assistance within the UM administration during and after the university’s tumultuous integration in 1962, when he composed speeches for then-Chancellor J.D. Williams. The Ole Miss Alumni Association honored Noyes with membership in its Hall of Fame in 1991, and his former student David Arnold and his wife, Barbara, of Yazoo City, Mississippi, honored him by establishing the Noyes Library Endowment. To make a gift to the Friends of the Library or the Charles E. Noyes Library Endowment Fund, send a check with the fund noted in the memo line to the University of Mississippi Foundation, 406 University Ave., Oxford, MS 38655; visit www.umfoundation.com/makeagift; or contact Angela Barlow Brown at 662-915-3181 or ambarlow@olemiss.edu.